The Lanka e News office in Malabe was set on fire last morning by a group of unidentified men. The incident took place at 1.30 a.m. The entire office was gutted when the police arrived after a call from a Buddhist temple in the neighbourhood. No one had witnessed them entering the premises, an employee said. 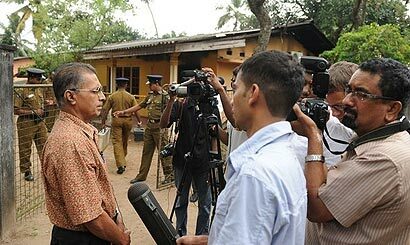 The News Editor of Lanka e News Bennet Rupasinghe charged that the attack was by a group not happy with the news reports of its website Lankaenews.com. “The incident took place at around 1.30 a.m. in the morning and we were informed by the residents in the area. There is a Devalaya right next to our office, who informed the police immediately,” he said. “All the computers, telephones, fax machines and the two photocopiers were completely damaged due to the fire. We had a library with books which are over 100 years old, all the books were completely burnt as well,” he said. “Important documents were also lost due to the fire. We were using the house for rent and we did not have any private security personnel there as we are financially weak. The web site is currently running but we are trying to at least publish two stories a day and we are now in the process of moving to a new place during the next few days,” he said. “Because it was a Sunday, the employees left the place at around 7-7.30 p.m. We did not lodge a complaint with the police as we did earlier, as the Police did not investigate the matter,” Mr. Rupasinghe said. Police media spokesman Prishantha Jayakody said that Inspector General of Police Mahinda Balasuriya had appointed a team led by DIG to probe the matter. He also said that a complaint has been lodged at the Thalangama police station. Meanwhile, media Associations, media organizations and political parties are to take to the streets today against the attack on the Lankaenews office. They said media associations, owners of media organizations could not afford to stay mum if the foundation was laid for an Egyptian style media suppression. Alliance of Media Organizations which comprises Working Journalists Association, Federation of Media Employees Union, Muslim Media Forum, Tamil Media Alliance and South Asia Free Media Association and Free Media Movement (FMM) told a news conference yesterday that they vehemently condemned the incident describing it as an attack on the people’s right for information. Harming each other will not going 2 end in this way.! And the one who go harmfully against someone, should expect a resistance too..!